Vice President for Policy Wayne Crews talks about why 2011 was a record year for both new regulations and their cost. He also talks about his efforts to make the opaque regulatory state more transparent. Besides his annual “Ten Thousand Commandments” report, Wayne has started a new TenThousandCommandments.com website to update regulatory data in real time. There is a also a 10KC Twitter account and a Facebook page to make it as easy as possible to keep an eye on what regulatory agencies are up to. 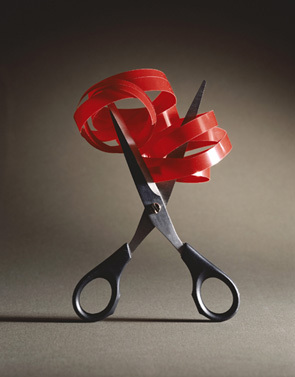 The total cost of federal regulation is $1.75 trillion. That’s true in terms of money. But money isn’t everything. Regulation also has opportunity costs. 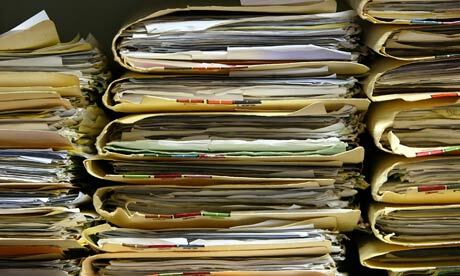 Workers spend millions of man-hours every year filling out forms and following procedures. That time could be spent on other things instead, such as finding ways to lower costs, improve quality and increase worker productivity. When there’s too much regulation, progress and innovation slow down. There is a second opportunity cost that is often overlooked. Companies don’t sit idly by when regulators propose new rules. They try to influence the process. Most companies, especially larger ones, often favor new regulations in their industries. They will pay lobbyists a lot of money to influence the rules in a favorable way – say, by handicapping a competitor. CEI Vice President for Policy Wayne Crews talks about why antitrust actually hurts competition, and offers some ideas for regulatory reform based on his recent articles for BigGovernment.com and The Washington Times, and on his annual Ten Thousand Commandments report. A reader sent the following email to Wayne Crews and I in response to our article that ran in today’s AOL News. My reply follows. Your vague double-talk would likely indicate that you are republican. The final statement in your opening paragraph seems to insinuate that the current administration (democrats) will escalate the already enormous number of federal regulations. If my recollection is correct, Clinton was the last president to really chisel away at some of this, and not only balanced the budget, but facilitated a surplus. Republicans, led by the renegade Bush, put us into a war, based on COMPLETE LIES which is the true base of the current enormous deficit. (Oh, and by the way, lots of Bush affiliates made a fortune over in Iraq. Hhmm?) This along with the deregulation pushed thru by the republican-controlled congress during the Clinton administration (giving banks ridiculously dangerous new powers) led to the economic CRASH of our current RECESSION (to put it lightly) – not to mention the crazy policies of the Federal Reserve and lack of oversight by the SEC during Bush’s DESPOTIC REIGN. The bail-outs pushed by Bush as he was leaving office and the subsequent pressured NECESSITY for Obama to continue in the same vein was certainly NOT the fault of the democrats. They were forced to deal with the CRAP left behind by the republicans, or face complete collapse of our entire economy. Bush and the republicans are the crazy lying right wing bigots that have the Christian right SNOWED. They could not care less about righteousness. They simply coddle the Christian right to get their votes with issues like Anti-Abortion and Anti-Gay-Marriage. The members of the early Church (followers of Christ after His death) sold everything and everyone put all their wealth together, and each was given as was needed (sort of like SOCIALISM or even COMMUNISM). The dog-eat-dog, survival-of-the-fittest stance of the republican party, supported by the Christian right, could not be any further from the system of the original followers of Christ, His Church. [Name redacted] – Thanks for writing. I am actually an independent. So is Wayne. I opposed the Iraq war from the beginning, am pro-gay marriage and pro-choice, I oppose the drug war and the PATRIOT Act, and I favor separation of church and state. It would be quite a stretch to call me a Republican. I share your negative opinion of Bush, and am proud that I never voted for him. One point of correction, though: Bush and his fellow Republicans didn’t deregulate a thing. In fact, more than 30,000 new regulations hit the books on his watch! You can check the data for yourself in Wayne’s new study at http://www.cei.org/10kc/. With 157,000 pages of regulations on the books from 59 different federal departments, it is quite difficult to even find a free market to blame for our troubles. That’s why there’s a growing consensus in the economic literature that decades of federal interventions into the housing market was a major cause of the recession. UPDATE: My correspondent replied with a very kind mea culpa this morning (4/16). He originally wrote in a fit of anger, and now retracts calling Wayne and I Republicans. Seems like a nice guy, actually. Last year Americans paid $989 billion in income taxes (Happy Tax Day!). What you probably don’t know is that federal regulations cost as much as the income tax plus another quarter-trillion — $1.24 trillion in all. Wayne Crews catalogues the damage in the freshly-released 2010 edition of “Ten Thousand Commandments.” Well worth a read. If you don’t have time to read the full study, Wayne and I summarize the main findings over at AOL News. 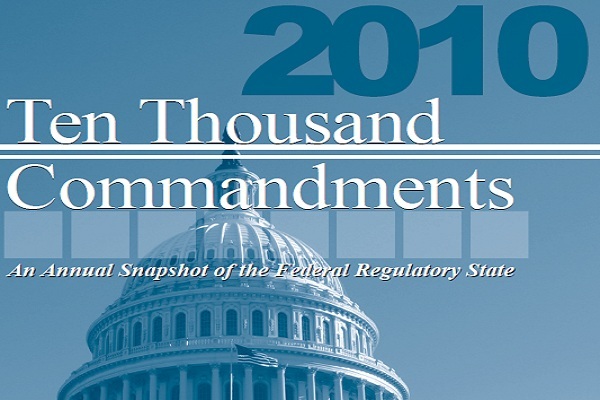 3,503 new regulations hit the books last year. That’s a new rule every two and a half hours, day and night, seven days a week. 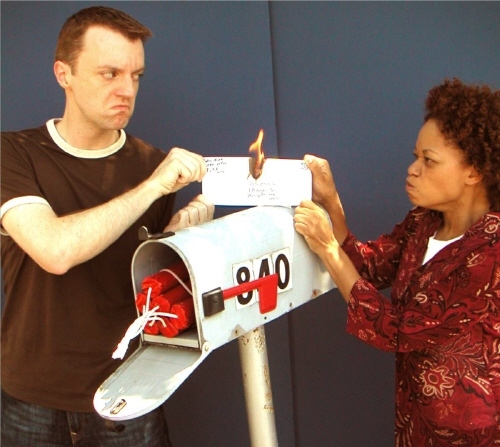 Tomorrow morning, I’ll be on the Paul Molloy Show at 10:15 EST to talk about that outrage and more. Tune in to WTAN 1340 AM if you live in the Tampa Bay area, KLRG 880 AM in Little Rock, AR, or click here to listen online. Better yet, CEI’s Wayne Crews’ latest edition of “Ten Thousand Commandments” is coming out tomorrow morning. Read it to learn how much regulation costs the economy (8.3 percent of GDP), and how much we would prosper if Washington would just lighten the load.